Maybe, once or twice in your life, you’ve experienced a surge of destiny so strong it made you believe in miracles. Such bolts from the blue seem to hit when weariness or ill fortune have plowed through the ground of reason, breaking it up so magic can take root. What follows is so perfect that to call it accidental defies belief. Diana Archer is an absolutely—mathematically!—average woman, living an unremarkable life, when destiny reaches her. Without quite knowing how or why, she finds herself leaving everything familiar and moving into a world where miracles are commonplace, where her supposed flaws become her salvation, and where each person’s story is everyone’s. In this exuberant allegory, bestselling memoir and self-help author Martha Beck takes readers into the wild parts of the world and the human psyche. 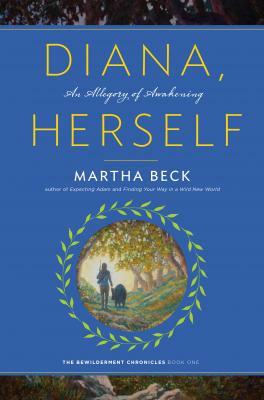 The story of Diana, Herself helps every reader chart a course for awakening to greater joy, adventure, and purpose. It feels almost magical to Diana Archer—out-of-work store clerk, former foster child, and bearer of multiple psychological diagnoses—when she’s pulled into the orbit of world-famous life coach and reality TV star Roy Richards. Together, Diana and Roy embark on the latest in his series of “conquests,” surviving a month in California’s trackless Sierras Oscuras National Forest. It’s in the forest that their quest devolves into disaster—and the real magic begins. Lost, alone, and dying, Diana is taken under the trotter of a benevolent spirit animal (or is it a projection of her perennially troubled mind?) who promises to take her home. But ”home“ proves to be a place much more mysterious than Los Angeles. Awakening is the goal, Diana learns, and bewilderment is the method. As the first volume of the three-part “Bewilderment Chronicles” proceeds, Diana will undergo a transformation that will change her irrevocably, and just possibly save the world. Let the enchantment begin. Even though this book is fiction and not self-help or memoir, Martha does not hold back her clear instructions for living with greater peace. I devoured Diana, Herself in the span of a few days; I daresay it is the most powerful book I’ve ever read for furthering my own personal and spiritual growth.